Home / Phcog J, Vol 8, Issue 4, Jul-Aug, 2016 / Review of the phytochemical and pharmacological activities of Euphorbia hirta Linn. 1Department of Human Genetics and Molecular Biology, Bharatiar University, Coimbatore – 641 046, Tamil Nadu, INDIA. 2Department of Biochemistry, Kanchi Shri Krishna College of Arts and Science, Kilambi, Kancheepuram – 631 551, Tamil Nadu, INDIA. The use of plant extract to cure diseases has been the traditional way used in many parts of the world. The synthetic drugs used now are more prone to cause side effects than curing the disease. Hence, the use of plant extract has now emerged due to their effective action against the disease without causing any side effects. The plants belonging to the family called Euphorbia are widely used in medicine for its wide medicinal properties. 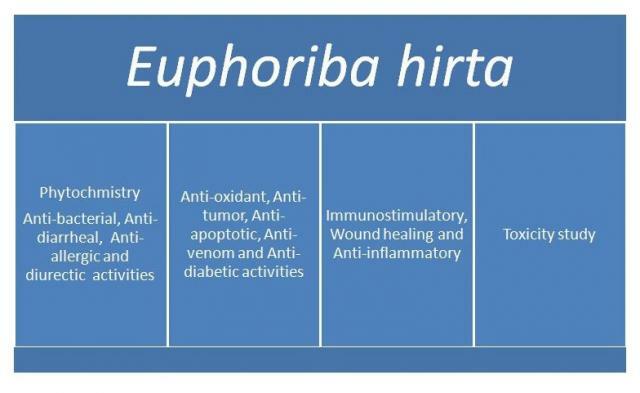 The plant Euphorbia hirta has properties like anti-bacterial, anti-diarrheal, anti-allergic, diuretic, anti-oxidant, anti-tumor, anti-diabetic, anxiolytic and sedative activity. This review contains the detailed information about all the properties of E. hirta. Kausar J, Muthumani D, Hedina A,, Anand V. Review of the phytochemical and pharmacological activities of Euphorbia hirta Linn. Pharmacognosy Journal. 2016;8(4):310-313.